Our Legal Advisory Board can answer some of your toughest bed bug questions. Having excessive amounts of bed bugs in any environment comes with great responsibility towards keeping customers, patrons, guests, employees or tenants and their families protected and safe from falling victim to them. Although most ethical and reliable companies will do the right thing; many times these situations are ignored and people get hurt because of ignorance, negligence or down right refusal to right the wrong. After exhausting all attempts of proper communication regarding bad bed bug situations; victims sometimes need someone well versed in consumer protection law violations, personal injury and premise liability to step in and help them best understand what needs to be done to resolve a situation. Understand that not all bed bug infestations qualify as a legal matter that would entitle someone to seek compensation. This is not about suing anyone and everyone because of a bed bug bite. We offer this resource to those who have exhausted every possible attempt to work with those who are responsible and have sustained injuries and/or damages resulting in physical or psychological problems, lost wages, and medical bills, damage to personal property, remediation expenses and extermination bills and cannot come to an equitable resolution. If you have been damaged or injured as a result of direct exposure to bed bugs in any of these situations, contact www.bedbuglaw.com for a free consultation. In many of these situations, a simple letter of understanding is enough to address the situation in a way that brings a new reality to the forefront and allows those the opportunity to get it right. As a legal resource for individuals seeking legal representation against negligent business owners and property owners for injuries caused by bed bugs nationwide, the website http://www.bedbuglaw.com/ is regularly updated with recent information related to changes in the law, bed bug lawsuits and settlements, complaints by guests or customers of negligent business owners and informative videos. Grant Schwarz has dedicated his career to protecting his community and helping others. Grant Schwarz began his career as a State Prosecutor in Florida protecting his community. While working as a prosecutor, Grant Schwarz earned a reputation as a vigorous advocate for his clients and a seasoned courtroom attorney. Grant now helps thousands of individuals injured by bed bugs to recover compensation for their injuries nationwide. Grant works tirelessly to enforce the rights of individuals against negligent and fraudulent business owners and their insurance companies. Grant’s trial practice with his firm focuses on consumer protection law violations, personal injury and premise liability. Grant and his team of bed bug advocates have represented clients in nearly every state in the country against most hotel/motel chains, national landlords and furniture stores. Grant has litigated bed bug lawsuits against most insurance companies and has gained inner knowledge about their claims handling processes through extensive litigation. 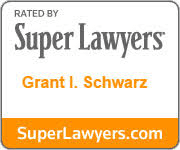 Named as a Super Lawyer, 10.0 rated Superb Attorney by Avvo, a Top 100 Trial Lawyer by The National Trial Lawyers, Grant is consistently recognized as a top litigator. Grant created www.bedbuglaw.com as a legal resource for individuals seeking legal representation against negligent business owners and property owners for injuries caused by bed bugs nationwide. The website is regularly updated with recent information related to changes in the law, bed bug lawsuits and settlements, complaints by guests or customers of negligent business owners and informative videos. Grant represents clients throughout the United States and has established a reputation for being an aggressive and committed advocate for his clients. The bed bug lawyers at BedBugLaw.com are available to provide you with a free consultation to discuss how we can help you to obtain compensation for your injuries, property damage, loss wages; inconvenience and incidental costs that you incurred following your “unpleasant incident” with beg bug bites. Call us at 888-274-9098 to request a free consultation. Disclaimer: The content on this site is offered only as a public resource service and does not constitute solicitation or provision of legal advice. We are not a law firm or a substitute for an attorney or law firm. We cannot provide any kind of advice, opinion, or recommendation about possible legal rights, remedies, defenses, options, or strategies. This site should not be used as a substitute for obtaining legal advice from an attorney licensed or authorized to practice in your jurisdiction. You should always consult a suitably qualified attorney regarding any specific legal problem or matter. The comments and opinions expressed on this site are of the individual author and may not reflect the opinions of a law firm or any individual attorney.